I have been in Cozumel for over a month and I have fallen in love with the island and the people. I cannot say enough about the wonderful people who live and work here. 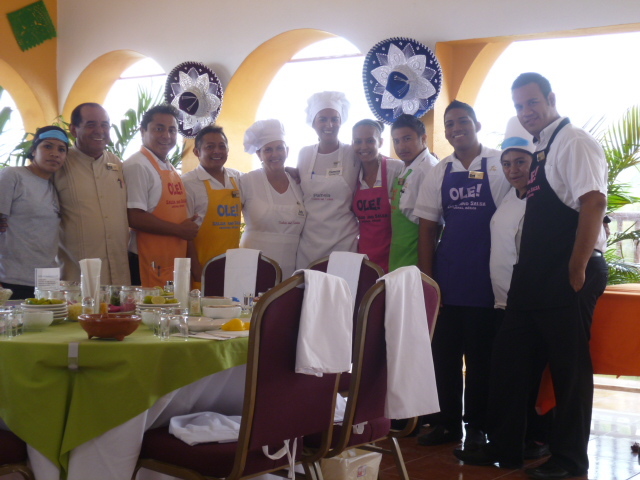 I am so happy to be a part of Salas and Salsa Cozumel as a Dancing Chef. I take the local transportation to work and walk home. I walk down a different street everyday to try and see as much as possible. Everyday I find new places to go and local restaurants. products. We ended the day with a beautiful sunset. Life is good, and especially in Cozumel. Come to see us on your next cruise. We have so much fun at Salsa and Salsa!!! 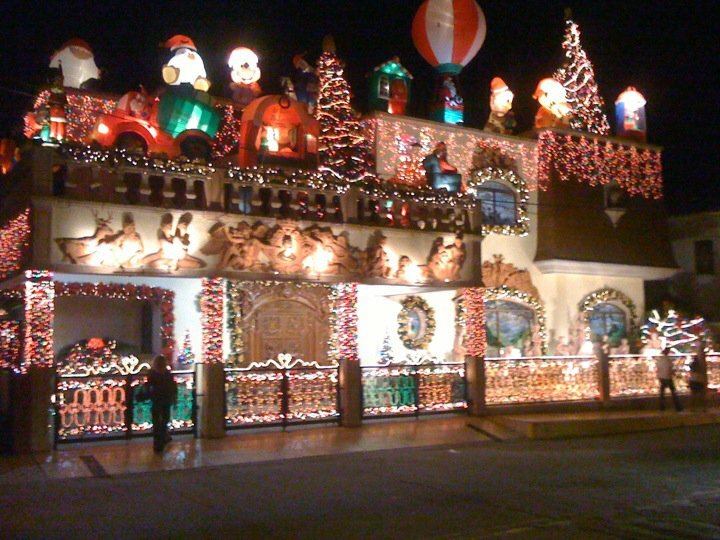 My neighbors here in Olas Altas are really in the Christmas spirit. They have decorated almost every inch of their house with lights, inflatable Christmas characters and recorded music to sing along to. People pass by on foot and car to stop and take a look as it is really pretty amazing. And of course the children are in awe!! 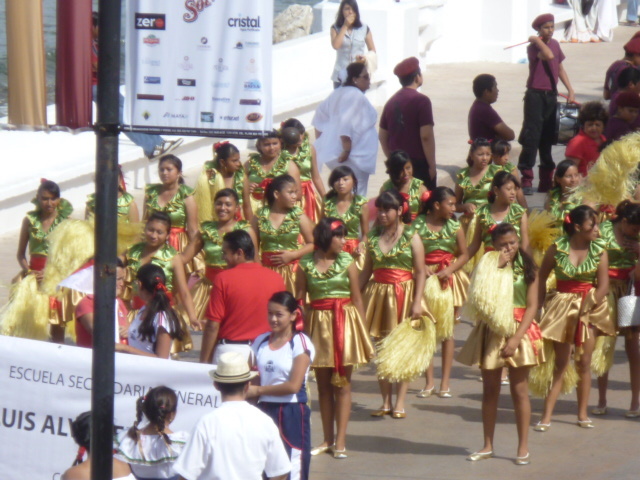 It’s beginning to look a lot like Christmas all around Mazatlan. Happy Holidays All. 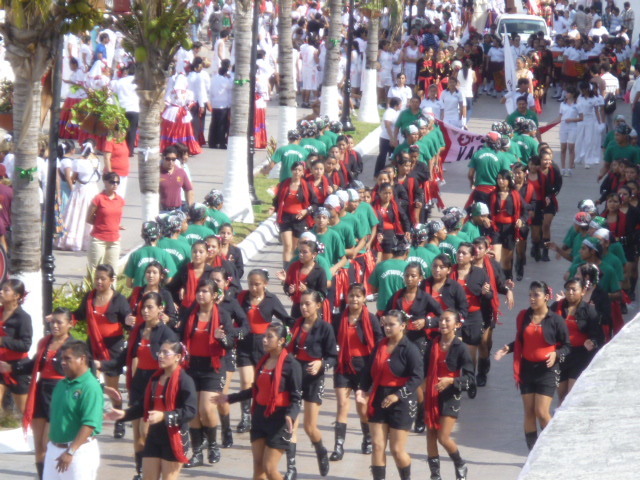 Dancing Chefs conquer the streets of Mazatlan!!! Together with Pacifico Beer, Ceviche and Carnival, nothing is so typically Mazatlecan as the Pulmonia. This is an open taxi, the Mexican version of a riksha with a Volkswagen engine. 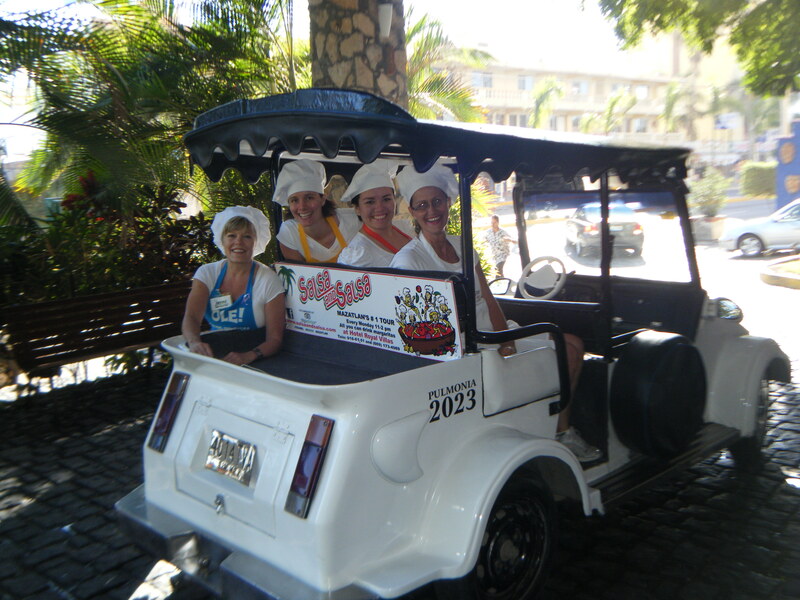 These taxis started driving Mazatlan’s streets back in 1965. They are not known anywhere else in Mexico. The literal translation of ‘pulmonia’ is neumonia. People thought they would get a neumonia driving this taxi!!! 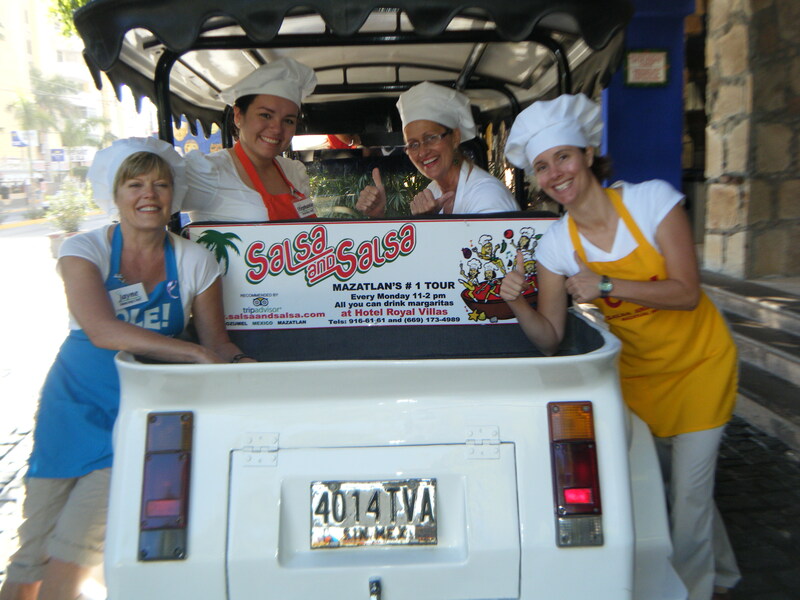 Recently the Dancing Chefs have taken 5 Pulmonias and decorated them with the new Salsa and Salsa ad. We’re so proud!!!! When you’re in town, try to look for them! Ah, the island life,palm trees swaying in the warm breezes. Gentle waves washing ashore over coral covered reefs. The quiet! Laying under palapa covered huts ,shaded from the sun while thinking of nothing other than the waiters return with our cool drinks. Stop the press! Not so fast lazy one,open those weary travelers eyes, what about 700 taxis lined up in a procession along the waters edge waiting for one ride from 30 thousand anxious passengers crowded around the nearest Sr. Frogs. Riding down escalators to find hundreds of vendors prepared to make the deal of the day. So what amigo! Welcome to Cozumel,Mexico my new favorite spot on earth or should I say in the sea? Its easy to find the bliss here, only minutes in any direction and a few steps into a turquoise colored sea, the quiet under water is compelling. I took my snorkel and headed out around the rocks. I happen to know that all fish hang out around the rocks. Most divers will tell you its because of all the food, but my conversation with a baby squid was other wise. They hide there,they know we are coming. And that we do! in droves and boats with tanks, fins and all kinds of funny looking equipment. What a strange site we divers must be. I remember once on the island of St.John,also in the Caribbean, we took a ride to a national park where the novice snorkelers could read signs planted underwater. We saw large brain coral and read about it while swimming to the next sign. At times it was hard to read with all the flapping fins of fellow snorkelers around us stirring up the sand. But once you venture out away from the crowds, the beauty of the underworld brings about a peacefulness unlike any other. 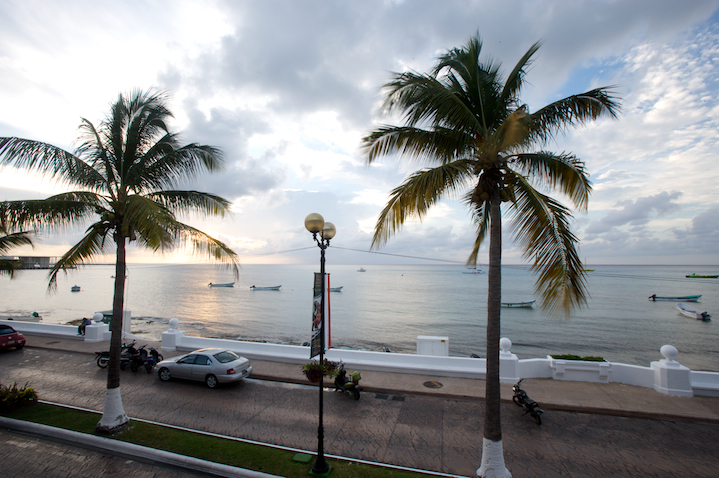 Cozumel offers that peace to those able to grasp the moment. The manta rays peeking out from under the sand, the stag horn coral and abundance of brightly colored,spotted and odd shaped fish, make for some of the best diving in the world. Yes ,now this is island bliss! Now for the island Blast! Whether your sitting with your feet dug in the sand or salsa dancing, your going to have a blast either way. Its true there are hundreds of taxis and thousands of cruise ship passengers coming down 3 enormous piers. But one hardly notices them as the music and beauty on the island hide this intrusion. Along with the hundreds of taxis there were also hundreds of poinsettias lining the streets. The main boulevard is so clean and painted a crisp white with built in benches that stretch for miles along the ocean front. 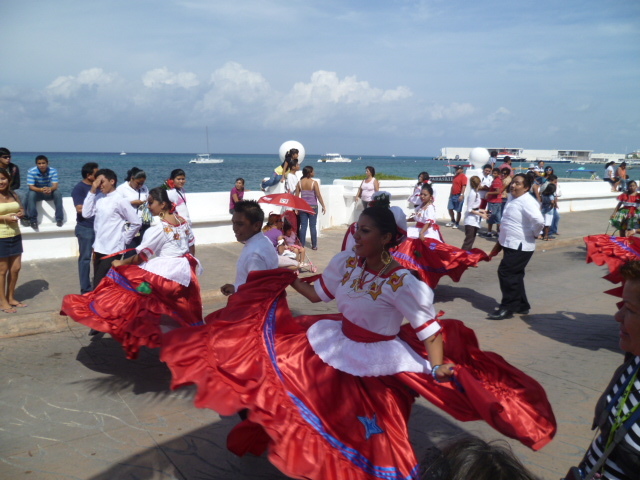 The main square is loaded with ornaments and the holiday spirit in Cozumel is found in the islanders themselves rather than in the bottom of a margarita glass. Wow what a place, what a wonderful adventure to see what paradise actually looks like. Both above and under the water. Cozumel has everything for everybody. The tour companies, impressive restaurants, the shops are modern and well appointed. You might think for a moment that you’re walking on Rodeo Blvd or 5th Ave. Every designer on the planet has a presence there and the stores are packed with eager shoppers, buying up the most modern Rolex watches to carved coconut heads. The restaurants we tried like Kinta, offer distinct European flavors while a few steps away you can feast on yummy tacos in the street. 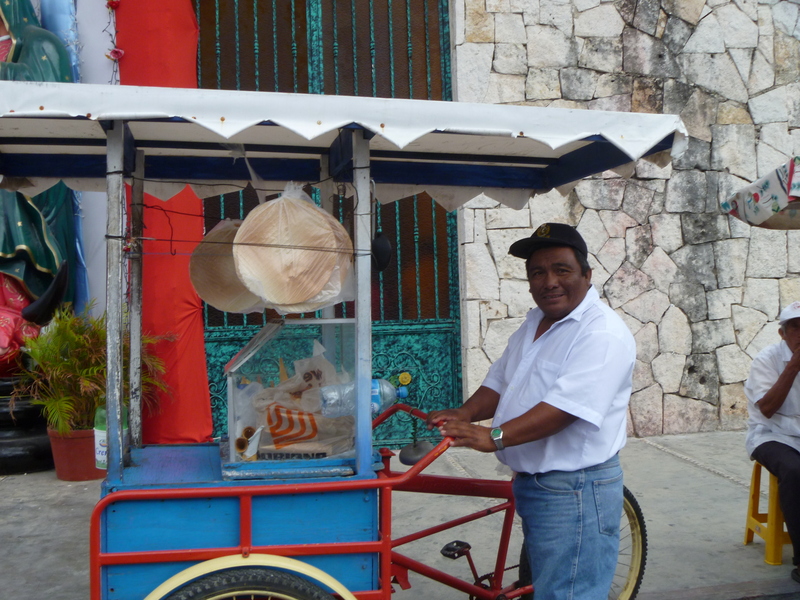 Starbucks and Planet Hollywood,Mayan ruins and rare birds all welcome the island travelers. What a pleasure to see a place that has everything and what a blast people have when they visit. We sure did. Now I understand why our Salsa and Salsa Tour at the Hotel Cozumel Resort is going to be the highlight of a visit to Cozumel for anyone arriving in paradise. The food and dancing,the underwater experience,don’t forget about the largest pool on the island. This is the bliss and blast all in one, the makings of lifelong memories.. Happy Holidays or should I saw Holidaze? Rompope is the Mexican version of egg nog and is traditionally spiked with Rum. The drink started at the Convent of Santa Clara in Puebla, Mexico back in the colonial period. Today Rompope is produced commercially and widely available in Mexico. Many of our Dancing Chefs, have been asking us how to get rompope or make rompope, sadly we know is really hard if not impossible to find it in the US so… as requested by you and because we know the holidays deserve a nice drink like this, here is the RECIPE!! In a medium sized saucepan over medium heat, mix together the milk, sugar, cinnamon bark and baking soda. When it begins to boil, lower the heat stand simmer for about 20 minutes. Set aside to cool, and strain to remove the cinnamon bark. Place the egg yolks in a mixing bowl and whisk or beat with an electric mixer about 5 minutes. , until thick and lemon yellow. While still beating, slowly, pour the cool milk mixture into the yolks. Return to the saucepan and cook over low heat., stirring constantly, until the mixture thickens and lightly coast the back of a wooden spoon. Remove from the heat and stop the cooking by pouring the rompope into a bowl (preferably metal) that is resting on ice in a larger bowl. Stir until cool. Gradually stir in the rum and its ready to serve, or it can be tightly covered in the refrigerator. Enjoy your Rompope and Happy Holidays Dancing Chefs!! Get ready Cozumel, because we’re heeeeeere! Wow! 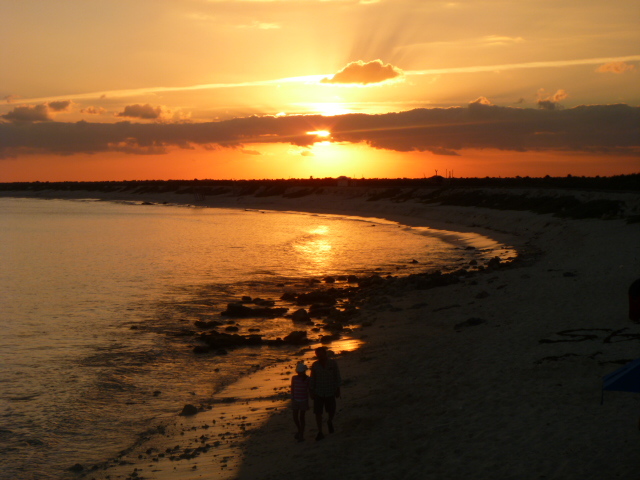 I can’t believe it’s taken me THIS long to write to you all about Cozumel!! Things have been a flurry of packing, unpacking, training, uniforms, new people, new friends, great new location, a new dancing chef partner and more! I want to share all these moments with you all! Since my departure from Mazatlan, I’ve gone through a whirlwind of changes in my life. From getting married in Vegas (more on that in a later post! ), to packing up all my belongings in Mazatlan, to moving into a new place in Cozumel, to starting Salsa and Salsa in a brand new location…not bad for 4 weeks ! Cozumel is a magical place. I arrived late in the afternoon, after leaving Mazatlan at 5am (yep, that’s a 3am alarm clock!) with a stop-over in Mexico City and then Cancun. We caught a 10 minute taxi ride from the airport to our new home, a one bedroom apartment smack-bang in the centre of town, right on the ocean! We dropped our bags off and went straight to the restaurant downstairs. Italian Cuisine has always been my favorite, so I was pleased to learn we had a fine-dining Italian place right below us! Dinner and a bottle of wine…ahhhhh…..Cozumel. Training for the new Salsa Team was to begin the very next day, so I got right into OLE Mode, with Manuals, Questionaires and more. Training was a hoot! I want to share some pics with you from our training sessions. 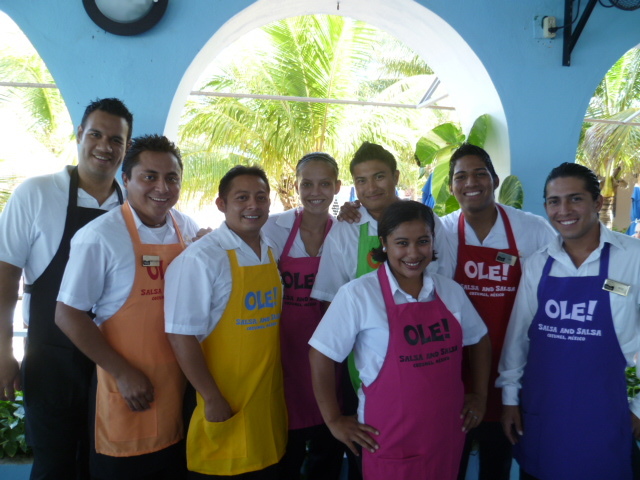 Our new Salsa Team are a fun, energetic and young team, that have proven to be quick learners and have all the enthusiasm we have looked for in our Dancing Chef culture. I knew these guys were the “ones” when I rang that little bell for the first time and a roar of “OLE!” came from their smiling faces. With training complete, we dared to invite hotel guests and friends to a “training show”, so our new team could practise and make perfect. A total success! I’m pleased to share with you the fact that we had nothing but good things said about the training show. Our guests left happy, yelling OLE and smiling and dancing down the stairs. 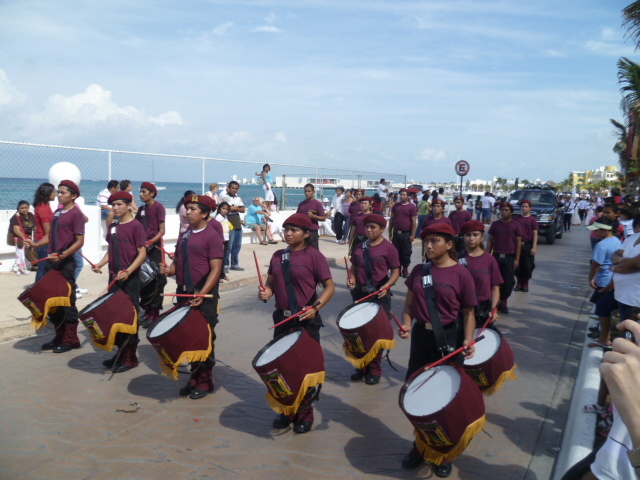 In the same week, Cozumel was filled with exciting events. Revolution Day (Nov 20th, 2010) surprised us with a glorious parade of young and old alike. We have a cute balcony overlooking the main street in Cozumel, so we happily sat there and watched the kids in their costumes. Here are a few pics of that day. So much color, so much music, and so much happiness – it’s all just so contagious, I love it!! 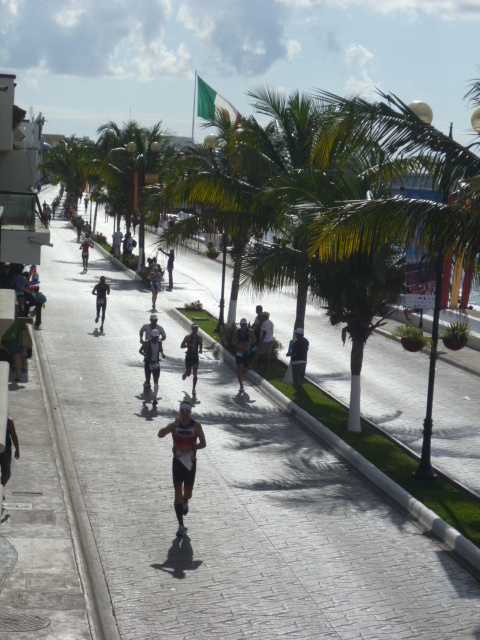 Iron Man Cozumel 2010 was also upon us here that week, so again, we spent time on the balcony cheering on men and woman who had already gone for the swim and bike portion of the race. The running was the last leg and their run was on the main street of town. I spent 1 hour on the computer and 1 hour on the balcony yelling words of encouragement “Keep on going!”, “Don’t give up!” and to the ladies “YOU GO GIRL!” (I got a few giggles from a few for that one!). Thursday was our first official show, and we have seen a total of nearly 60 people in 3 days…not bad for a new tour 😉 We know that in a matter of a few weeks, word will spread and the popularity we are so blessed to have in Mazatlan, will quickly follow us here. We’re humbled by all the comments and words of encouragement we receive from guests and friends alike, thank you all. This has been a challenge…a life changing, exciting and glorious challenge. But we’ve done it! We’ll have Lela here too – for the first 3 months in Cozumel, Lela will be collecting donations to help build a Blood Bank here on the Island. There is no Blood Bank and locals are required to catch the ferry to Playa del Carmen, then bus it to Cancun…a trip and expense that most locals are unable to afford. With a Blood Bank here on the island, we can hopefully save some lives and make a difference to those who need a helping hand. Keep an eye on those Lela pictures and reports…it’s going to be exciting to see what she will accomplish here! 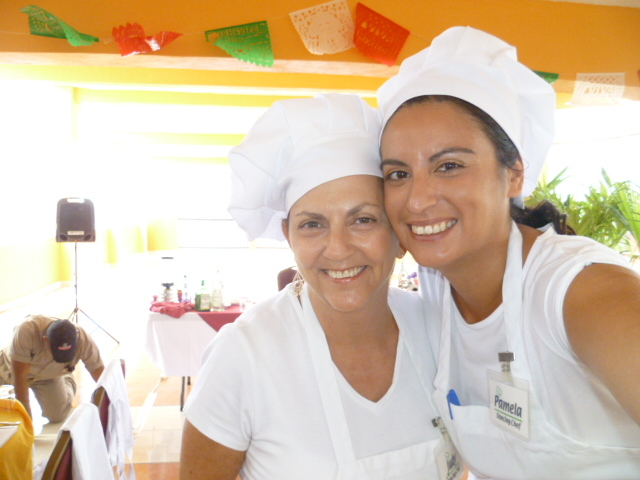 Head Chef Leonique made a cameo appearance this week at the Cozumel show…needless to say, we got a good injection of new energy there! 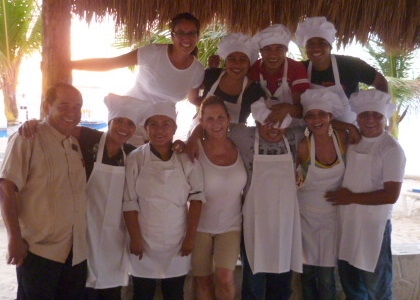 Stay tuned for more fun Cozumel news! 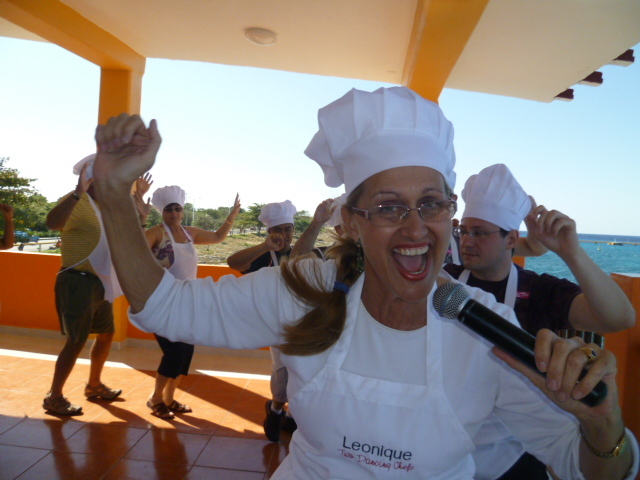 Head Chef Leonique does the Conga in Cozumel! Hope you all visit us in Cozumel soon! *Lupus ﻿﻿﻿﻿it is often referred to as a disease of a thousand faces. (Because doctors tend to misdiagnose it, ’cause a lot of the symptomps are similar to other diseases). *The official logo for Lupus is a butterfly, because one of the most common symptoms is to get skin irritation on your face in the shape of a butterfly. *9 out of 10 people that suffer from Lupus are women, usually is really rare in men, but when men have it is usually more agressive. *Lupus usually runs in the family. People don’t tend to relate it to their family members, because this disease was and is often confused with many other diseases, such as Multiple Sclerosis, ﻿Reumatoid Arthritis and even Skin Cancer. The reason why I know these facts is because as we’ve been saying it all month long, my oldest sister Ciara has been suffering from it for almost 12 years. It took over 2 years to find out it was, after all, Lupus. Back in that time I was too young to even understand what she was going trough, but as many girls that have Lupus, with the proper treatment, she lives a normal life, enjoys working as a graphic designer and she is an inspiration for me to live life to the fullest. 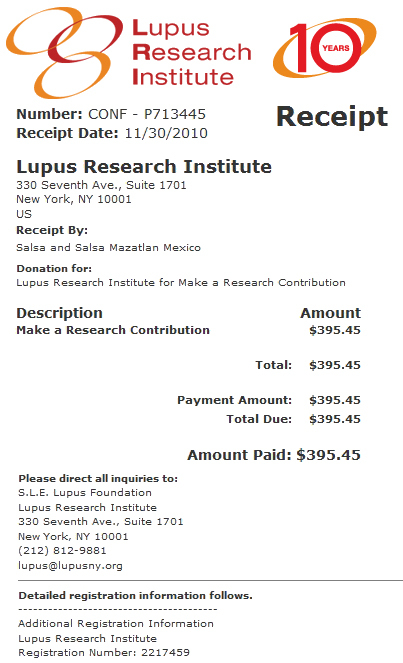 I’d like to say I proposed november’s charity to be Lupus because I wanted to honor her, but I think I’m the honored one by having such a strong sister. So from the bottom of my heart Thanks to all the Dancing Chefs that supported LELA to raise this money for the Lupus Research Institute!!!! and keep in touch to find out how much we get for the next cause!!! !